I had previously discussed how crime by women was handled by Simon and Kirby (Crime’s Better Half). However here I would like to briefly discuss the criminal couple, much rarer perpetrators of crime in Simon and Kirby or real life. The most famous today would be Bonnie and Clyde. 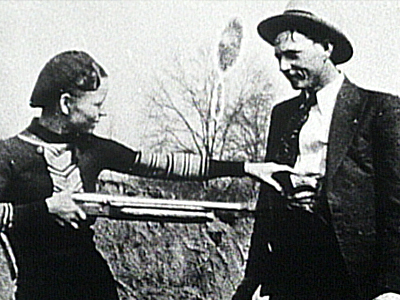 Bonnie Parker and Clyde Barrow and other members of their gang were active between 1932 and 1934. It was the fact that they were a couple that projected Bonnie and Clyde into national infamy. The gang really were not very talented criminals. They only rarely robbed banks and never got much for their efforts for their few attempts. Generally Barrow gang robbed smaller institutions like grocery stores and gas stations. They were cold blooded killers quick to use their weapons against lawmen or civilians alike. Frankly the Barrow gang without Bonnie would not a received much attention outside of Texas. During one quick get-a-way, the Barrow gang left behind a some rolls of film. The photographs that came from the developed film were sensationally. Among them were shots of Bonnie holding up Clyde at gun point and another of Bonnie with a cigar and a gun. These photos of the gang fooling around were just that, nothing more than fiction. Bonnie did not participate much in the actual crimes and she did not smoke cigars. But the photos provided a lot of national publicity and played an important part in the legend that followed. 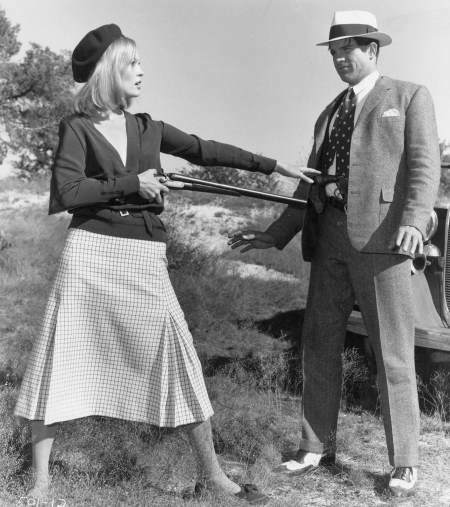 And Bonnie and Clyde did become a legend with two movies and one made for TV movie; the Bonnie Parker Story (1958) and the more important Bonnie and Clyde (1967) and Bonnie & Clyde, the True Story (1992). Eighty years later they are still well known. 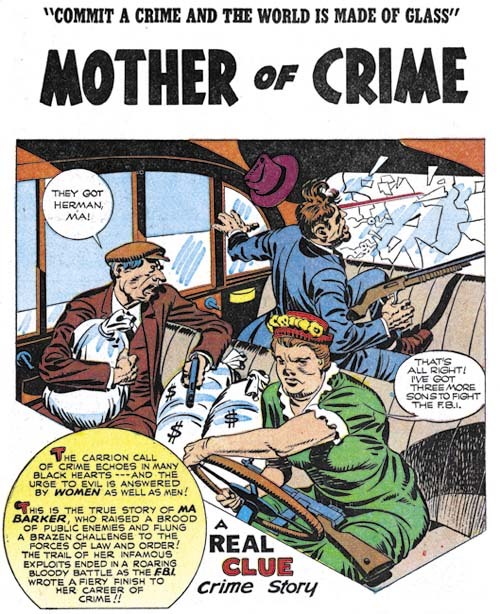 While Bonnie and Clyde may have been the most famous criminal couple Simon and Kirby never featured them in any crime comic. 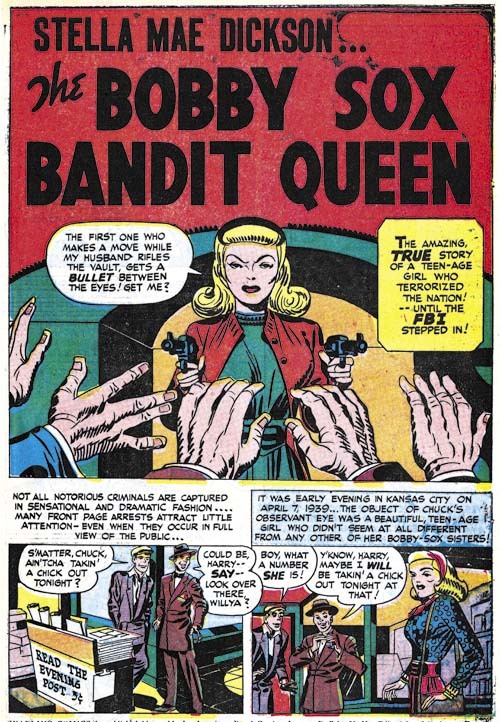 There was, however, another criminal couple that were made into a Simon and Kirby story; Stella Mae and Bennie Dickson in “The Bobby Sox Bandit Queen” from Headline #27 (November 1947). Stella and Bennie were not as famous (or infamous) as Bonnie and Clyde. They were reported in the press of the day but as far as I know no movies were ever made based on them. But in many ways they were a much better criminal couple then Bonnie and Clyde. For one they were much more successful in robbing banks. In one bank hold up they got away with about $47,000. Not bad by today’s standards but pretty good during the depression and much better than the Barrow gang ever did. One bank robbery by Bonnie and Clyde got them $115. 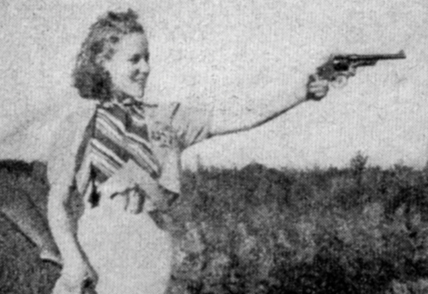 And while Bonnie posed with a gun for pictures but was not really participate much in the actual crimes, Stella was very handy with a gun and a big asset in the robberies. In fact her sharp shooting of a police car’s tires during a chase allowed the criminal couple to make a clean get-a-way. It is easy to see why Simon and Kirby picked Stella Mae and Bennie for a story but why did they never do a story on Bonnie and Clyde? Could it be the rather gruesome end that Bonnie and Clyde had under a barrage of bullets? Seems doubtful since Joe and Jack had depicted similar deaths in the past and did show Bennie Dickson’s comparable end. No, I think the real reason Bonnie and Clyde were off limits as far as Simon and Kirby were concerned was due to their marital status, or more precisely lack thereof. Stella Mae and Bennie were legally married, Bonnie and Clyde were not. That Bonnie and Clyde were unmarried, romantically involved and living together added spice to their story. But while that sold papers it was not the sort of thing that many would consider appropriate for a young audience. Dr. Wertham may have declared that comic books corrupted their youthful readers but Simon and Kirby were really more careful about what they included in the comic stories they created than their critics would admit. Still I would have loved to have seen what Simon and Kirby would have done with Bonnie and Clyde. There is one coloring peculiarity whose significance I am still uncertain of that appears during the early crime Headline period. It concerns the use of middle cyan (C50) as hair coloring. The limited palette available for coloring presented a problem when it came to depicting black hair. The problem was not that black was unavailable but rather that using black alone would result in a massive black with no distinction for strands of hair. The convention most comic colorists adopted to circumvent this problem was to use cyan (C) or blue (CM25) to represent black hair. Technically not truly accurate but a convention so widely used that comic book readers took it for granted. This use of cyan or blue to represent black hair is followed in most Simon and Kirby crime stories, but not all. Some stories feature the use of middle cyan (C50) instead. This unusual choice was not an accidental misread by the printer of the original color guide. The presence of pure cyan (C) on the same pages of middle cyan (C50) hair indicates that this was in fact the colorist’s intent. Nor does this seem to be an attempt at representing gray hair. While middle cyan (C50) works quite nicely as gray hair it was used primarily on people with an otherwise young appearance. Further I have not yet found a story which used middle cyan (C50) and either cyan (C) or blue (CM25) for hair coloring. What is less clear is what this use of different hair coloring signifies. Does it indicate two different colorists at work or one colorists purposely adding a little variation to his output? I am still undecided but so far I have recognized no other coloring distinctions between the stories with the two ways of indicating black hair. 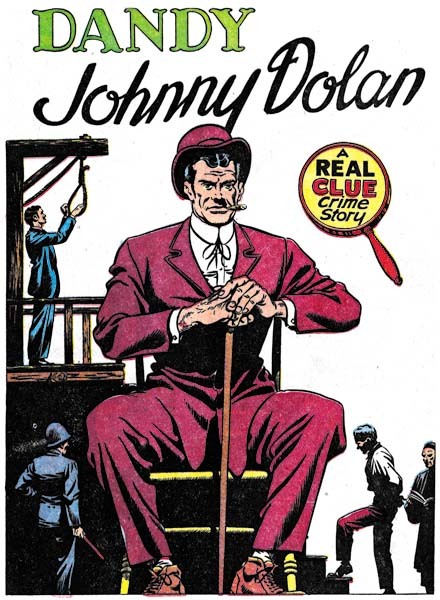 In the previous chapter I mentioned the occasional unusual coloring of people in the early Prize crime comics. I wondered if the same special color was ever done on artwork not drawn by Jack Kirby. A search reveal only a few. I do not make much out of their scarcity as unusually colored people are pretty rare even in the Kirby drawn material. 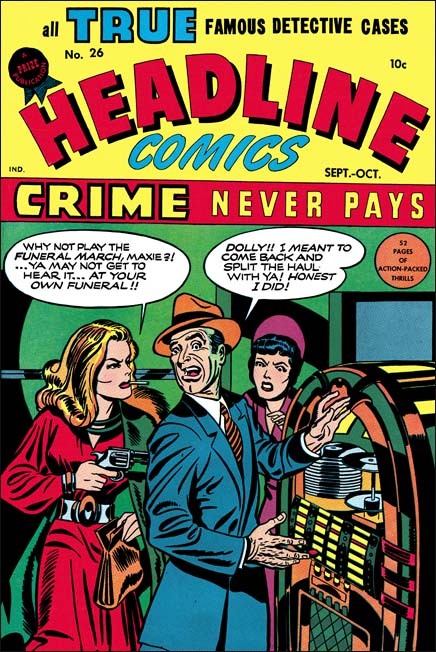 Further most of the examples are found in the earliest issues of the crime version of Headline; issues that Kirby drew most or all of the work. By the time other artists were frequently used less effort seemed to have been expended on the coloring and such unusual coloring of people was no longer done. Still the presence of unusually coloring in material not drawn by Kirby conforms with my believe that the same colorist worked on both Kirby and non-Kirby material. 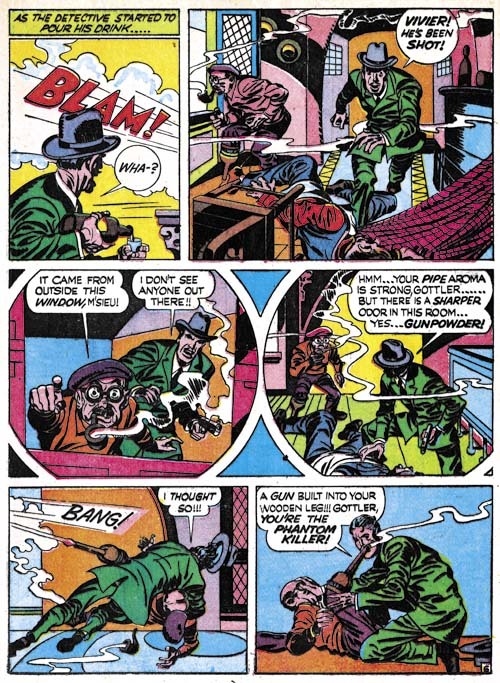 In the previous chapters I discussed the coloring used in Simon and Kirby crime comics published by Hillman and Prize. Since this material was published during the same period (March to September 1947) differences in the coloring can safely be attributed to the presence of different colorists. However for the period that follows only Prize published Simon and Kirby crime comics. Under these conditions it become less certain that changes in coloring would indicate different colorists. Such changes might also indicate the evolution of a single colorist style. One coloring change that is found in the later period and does seem to be significant is the appearance of the use of pale green (C25Y25). The use of pale green (C25Y25) and pale yellow (Y25) was an important distinction between the Hillman and Prize colorists. Now pale green appears does appear in Prize crime comics but without pale yellow. Further studies are needed, but at this time I find no obvious differences between the coloring. So was this just the evolution of the style used by a single colorist or a change of colorists? I am not ready to hazard a guess at this time. I consider these three chapters on Simon and Kirby colorists as just an initial step. Much further studies are needed. Of particular interest would be around 1954 when Simon and Kirby were producing comics for Prize and Mainline (there own publishing company). 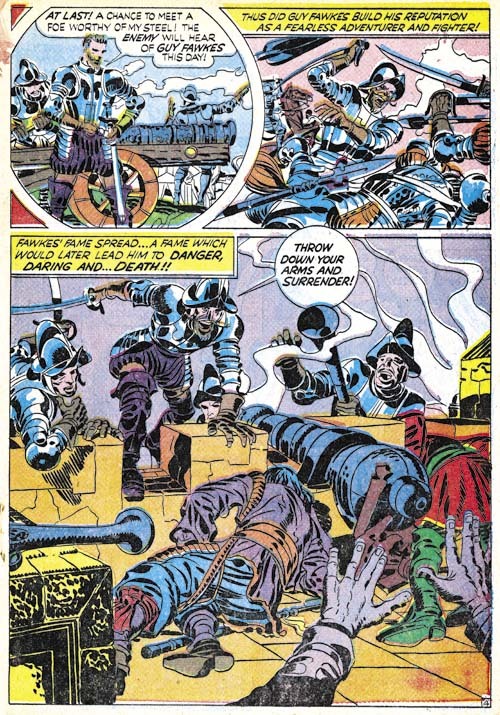 This would provide another chance to compare coloring from two different publishers from the same time period. I am not sure when, but I will be returning to this topic sometime in the future. In the previous chapter I discussed the coloring used by Hillman in Clue Comics and Real Clue Crime Stories. Now I will write about the coloring used in Headline Comics published by Prize during the same period (March to September 1947). To facilitate comparing the colors I have devised a standard palette of 38 colors. That is not to say that the standard palette will cover all comics published during the golden age. I may have to expand it in the future but it covers all the colors I will be discussing at this time. Hillman used 34 of the standard palette while during the same period Prize’s Headline used 30. However this is can be a bit misleading because not all the colors that Hillman used but Prize did not are really significant. In particular Hillman rarely used deep violet (CM) or red brown (MYC25) (see the previous chapter for an explanation of the terminology I am using to precisely identify the colors). However there are some colors not used by Hillman that are pretty rare in Headline; deep green (CYM50), dark green (CYM25) and emerald blue (CY25). There are two colors absent from Headline that did in fact play an important roll in the Hillman palette; pale yellow (Y25) and pale green (C25Y25). However I do not believe that colorists can be identified by the presence of a particular color in their work. With such a limited palette available to golden age colorists it seems almost certain that more than one used pale yellow (Y25), pale green (C25Y25) or both. While the early Headline crime colorist did not use pale green (C25Y25) this color would appear in a later period, although without pale yellow (Y25). To circumvent the limitations of using just the color palette, I also compare how particular objects are colored. For example both the Hillman and Prize colorist use dark blue (CM25) for police uniforms but the Hillman colorist uses dark brown (MYC50) for the shoes and boots worn by the police while the Prize colorist uses cyan (C). 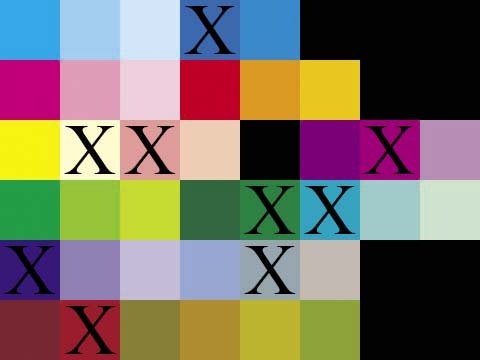 While the Hillman colorist generally uses middle green for foliage, the Prize colorist uses a greater variety of colors such as green (CY), middle green (YC50), light green (YC25) and even some very unnatural colors such as middle magenta (M50) or orange (YM50). Furniture was coloring by the Hillman artist in a single brown or more rarely in two brown colors (usually CYM50, YC50M50, YC50M25 or YC25M25). The Prize artists often did furniture such as desk in a combination of two colors selecting from the same browns but also sometimes using some very unnatural colors as well. 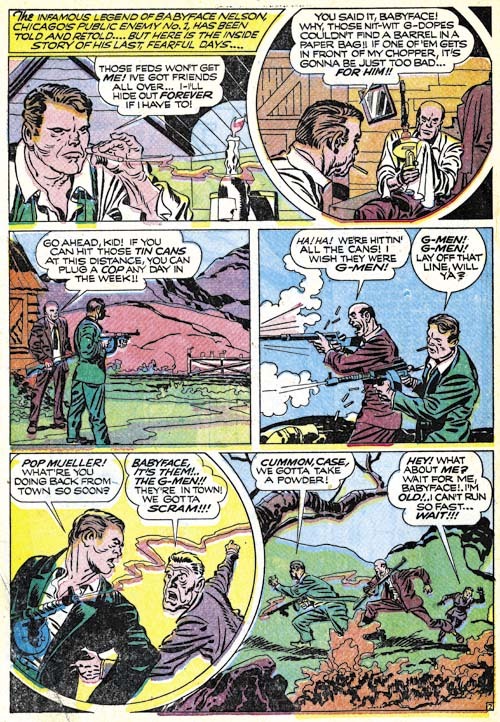 When the Hillman colorist did night scenes, such as in “Get Me the Golden Gun” (Real Clue Crime Stories v.2 n.6, August 1947 as shown in the first chapter), only the presence of the moon suggests that the story occurs in the dark otherwise the coloring is just like in the day scenes. The Prize colorist, however, did distinctive night scenes. Coloring for the night scenes is largely limited to blue colors (generally C, CM25, C and C50) or violets (C50M50 and C25M25). Perhaps the most distinctive trait of the early Prize crime colorist was the occasional unusual coloring of people. The effect I am referring is not the blocking out of a figure in a single color (usually light violet, C25M25) that both the Hillman and the Prize colorists would sometimes do. The Prize colorist would go much further and use very unnatural colors. The Prize colorist did not do this very often but I have never seen the Hillman colorist do it. The period I have been discussing in this and the previous chapter was from March to September 1947 during which time Simon and Kirby produced work for both Hillman and Prize. Undoubtedly because Prize offered a better financial deal, afterwards Joe and Jack stopped working for Hillman and Prize became their almost exclusive employer (they still were providing Boy Commandos for DC). I will discuss some of the coloring done in the Headline Comics and Justice Traps the Guilty in the next chapter. They said it on the cover, “All True Famous Detective Cases”. Would Joe Simon and Jack Kirby say that if it was not true? But surely not all the stories in Headline Comics #24 could be true? Who would be credulous enough to believe the tale told in “A Phantom Pulls The Trigger”? A man going about the French countryside killing individuals for the sole reason of keeping the size of the population down? Whose philosophy comes from reading Thomas Malthus’ “Over-Population”? A man who avoids detection by using a gun installed inside his wooden leg? Who after being uncovered and arrested is allowed to keep his now disarmed wooden leg and has friends smuggle in a new gun and bullets? Who uses his re-armed wooden leg right before his execution with unintended results? Who could possibly believe such an incredible story to be true? Well as true as any story told by Simon and Kirby who seemed to adhere to the philosophy of never letting the facts get in the way of a good story. But the basic facts portrayed in “A Phantom Pulls The Trigger” all appear to be true. There really was a man who went by the names of Herman Gottler and Raoul Croc as presented in the story but not included in the story were his other names Gottlieb Einhalter and Armande Giraud. His armed and deadly wooden leg was so devious that after he had been found in the vicinity of several murders it remained undetected even though he was carefully searched. He undoubtedly would have continued to evade the law for some time had not one of his victims lived long enough to report seeing smoke coming from the end of the wooden leg. After capture, Raoul was quite open about what he had done and why he did it. In fact he attracted a number of admirers. And yes the authorities really did allow him to keep his unarmed wooden leg which Raoul re-armed with the help of his friends. While seated waiting for the executioner’s sword, Raoul aimed his leg at one of his followers and set his pistol off. Only it seems the pistol’s muzzle had become blocked with mud and stone and therefore exploded instantly killing Raoul. But how had Simon and Kirby come across this story? The events occurred in France during the early part of the 19th century so it was unlikely to have been a object of discussion in New York City during the mid 20th century. A Google search revealed a few possible French links (I cannot read French) but only a single English source. That source was “Howitt’s Journal of Literature and Popular Progress, Volume 1” by William Howitt and Mary Botham Howitt published in 1847 (the story told on pages 103 to 105 and 122 to 125). This does not seem to be likely reading material for either Joe or Jack. Perhaps Jack heard the story told in France while he was there as a soldier during World War II. 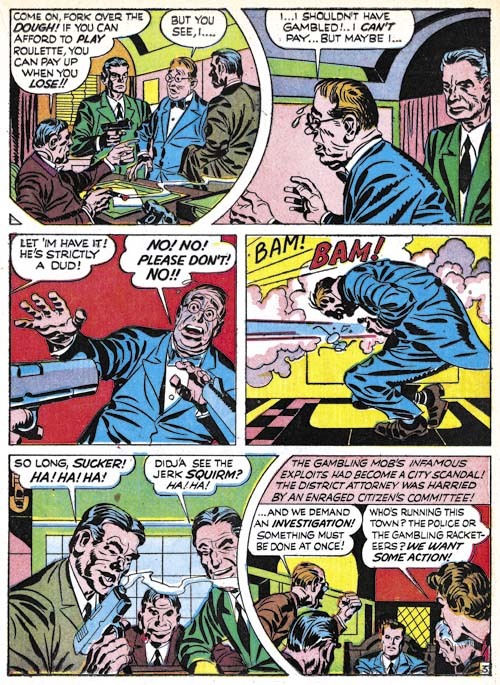 Simon and Kirby crime tales, at least the earlier ones, were based on true stories. In a recent post I wrote about Simon and Kirby’s “Let Me Plan Your Murder” and the serial killer H. H. Holmes on which the story was based. I noted differences between the story which Joe and Jack presented and the facts that can be found on the Internet. These differences could be explained either as “poetic license” or inaccurate sources. Unfortunately there is no way to decide between the two explanations without knowing the actual sources used by Simon and Kirby. I remember reading somewhere (but regrettably I am not sure where) that one of the books Simon and Kirby used was “The Gangs of New York” by Herbert Asbury (1928). The book covers New York’s criminal elements from 19th to the early 20th centuries. Apparently this book was quite popular as there were four printings in the first year alone. 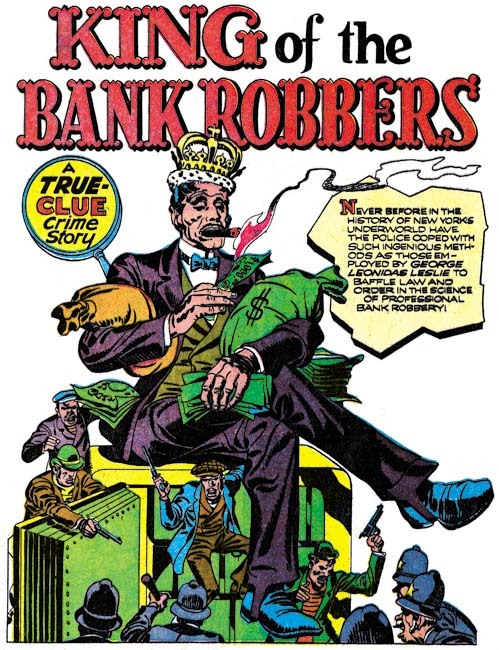 One of Simon and Kirby’s first entries in the crime genre was “King of the Bank Robbers” which was about George Leonidas Leslie. The same title was used for Chapter 10 of Asbury’s TGoNY. Asbury’s presentation pretty much matches the story depicted by Simon and Kirby. The main difference between the two takes is that Asbury went into more details than Simon and Kirby. However Joe and Jack embellished the facts to make it more of a story. It has been said that during their period of greatest renown the captains of the Whyos would accept no man as a member until he had committed a murder, or at least had man an honest effort to thus enroll himself among the aristocracy of the underworld. At one point Pike Ryan presents a poster showing the business rates, that is what to charge for commissioned crime ranging from blackening eyes to “da big sleep”. In the book Ashbury describes how when arrested Pike Ryan was found to have just a list and while the wording is not identical the rates were just as Simon and Kirby provided. Simon and Kirby where not the only ones making use of Ashbury’s TGoNY. “Dandy Johnny Dolan” had no involvement from Simon and Kirby. While it just does not have the Simon and Kirby magic touch, it still is a rather nicely written and drawn story. 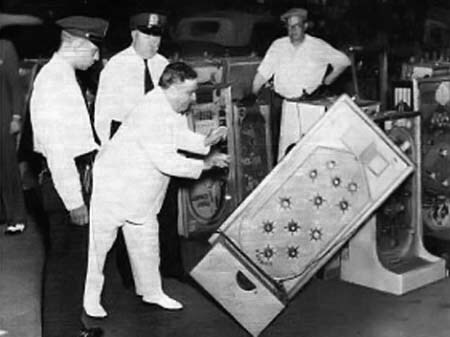 But once again the events found in the story match what Ashbury presents in TGoNY, particularly how a cane Dolan took off one of his victims lead to being arrested for the crime. 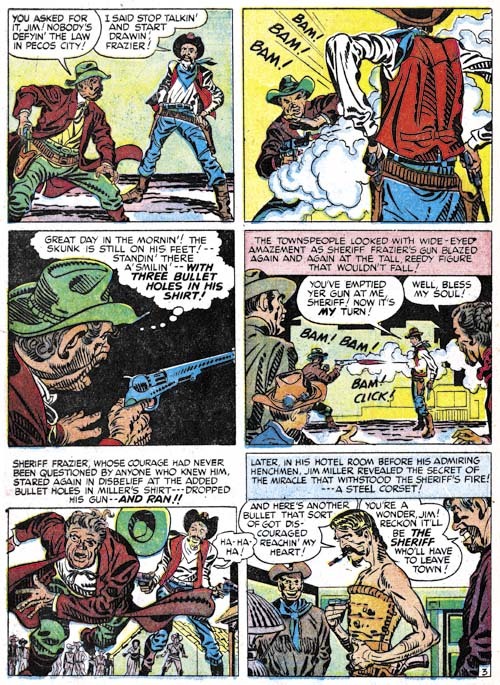 All the comic book artists that used “The Gangs of New York” took liberties with the facts presented by Ashbury. In some case just to make a better story but in other cases because the true facts might be a little bit too much even in those pre-Comic Code days. Simon and Kirby might present some woman as a gangster’s girl friend but in reality she might have been a prostitute (and the criminal a pimp). It is hard to understand what Ashbury’s use of the word gangsters was if it excluded organized crime of his day. “The Gangs of New York” was published in 1927 about eight years after prohibition came into effect with the Eighteenth Amendment of the Constitution. Trade in illegal booze provided an abundant criminal income which propelled organized crime to great strength. 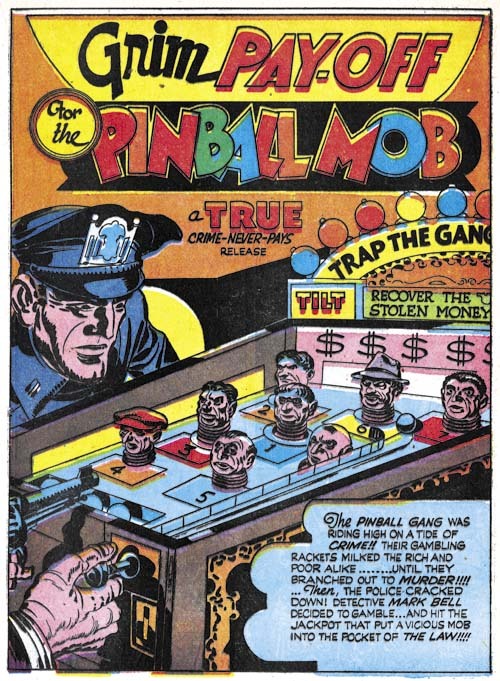 Ashbury may have been blind to the new gangster, but the crime comics, including Simon and Kirby, were not. 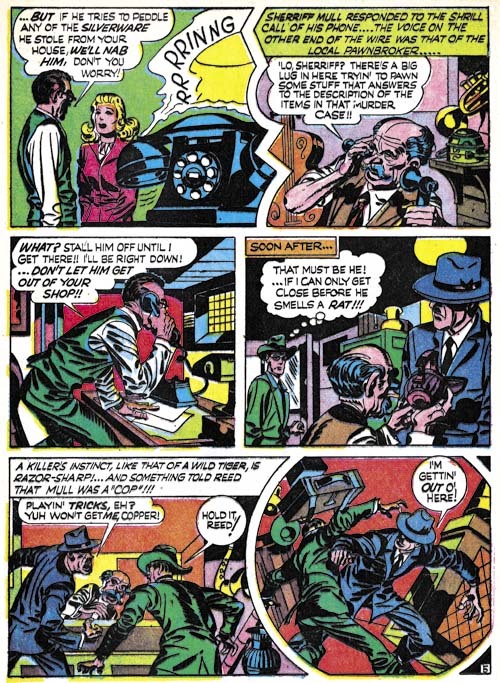 Simon and Kirby only worked in the crime genre during two periods. The first, and most extensive one, was from 1947 to about 1950 when the worked on Clue and Real Clue Comics for Hillman, as well as producing Headline and Justice Traps the Guilty for Prize. The second occasion was when they produced Police Trap for the own publishing company Mainline. Joe and Jack were always very creative and the crime genre gave them a wide range of subjects. They produced stories about gangsters, western outlaws, and other historical criminals. 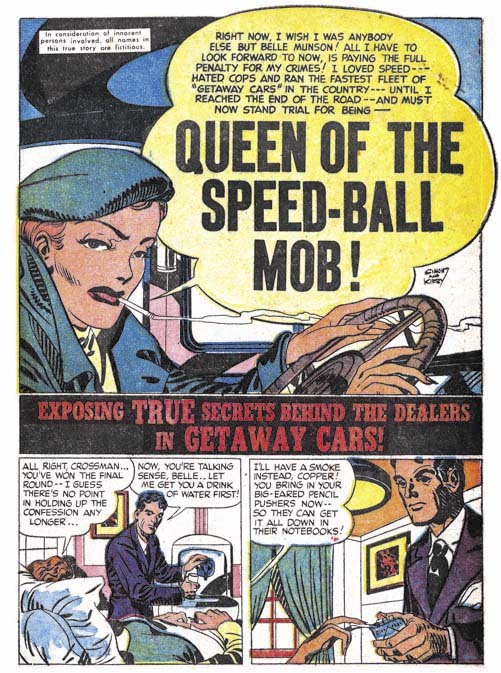 Another variation Simon and Kirby seemed fond of were women criminals. By no means were Joe and Jack the sole comic book creators that did work about crime by females (there even was a title Crimes By Women published by Fox). However like pretty much everything Simon and Kirby did, they created some very memorable work about women criminals. The first of Simon and Kirby’s beautiful villains was Velvet. She appeared in the second story about Packy Smith, a gentlemen highly sought after for the element X contained in his body. Packy was much very taken with the charming Velvet Silver, only to end up betrayed by her for the bounty that a crime lord had placed on his head. But once she was paid for her efforts, Velvet then proceeded to betray in turn the crime lord and freed Packy. Velvet may have been larcenous but she also had a heart of gold. A villain you cannot help but love. 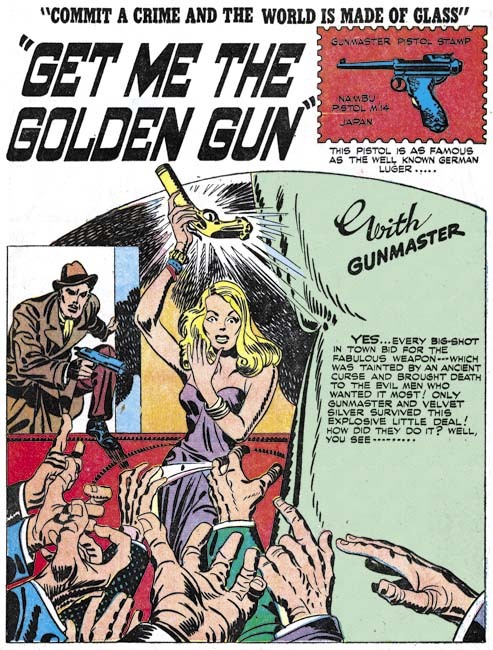 Packy never made a third appearance, but Velvet returned without Packy in “Get Me the Golden Gun”. It was the hero, Gunmaster, who now fell under her spell. While Packy had been a criminal himself, Gunmaster of course was not. So he found his attraction to Velvet to be very troublesome. 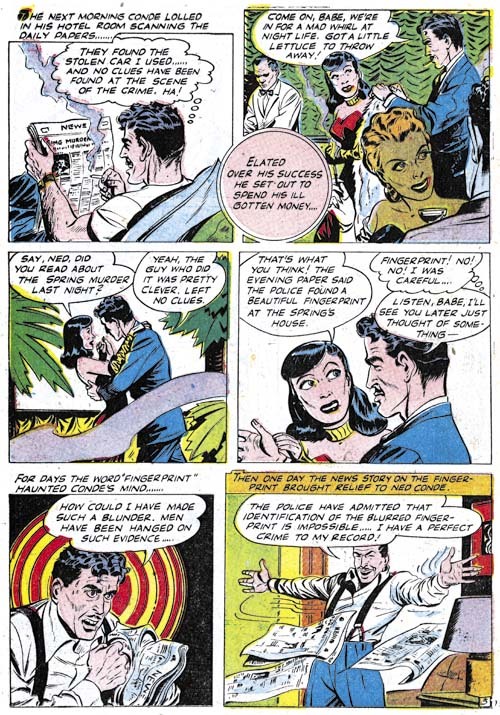 While she was not quite so villainous as Velvet, Simon and Kirby developed a similar relationship between Riot O’Hara and Link Thorne in “The Flying Fool” (produced at the same time and for the same publisher Hillman). Gunmaster and Velvet were clearly meant to be fictional however the work Simon and Kirby produced for Prize were meant to be considered as true stories (or at least initially). So similar mismatched romance between a hero and a criminal were not repeated in Headline or Justice Traps the Guilty. Still women criminals played an important part of the Simon and Kirby repertoire for Prize. Often when the lead character was a female, Simon and Kirby would present the story as if it was told by the woman. Generally in such cases, the story would start with what I describe as a confessional splash. 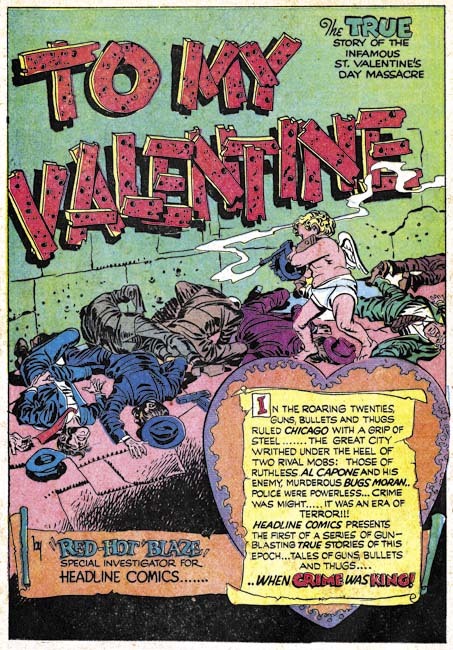 A splash were the main character introduces the story with their speech balloon forming the feature’s title. 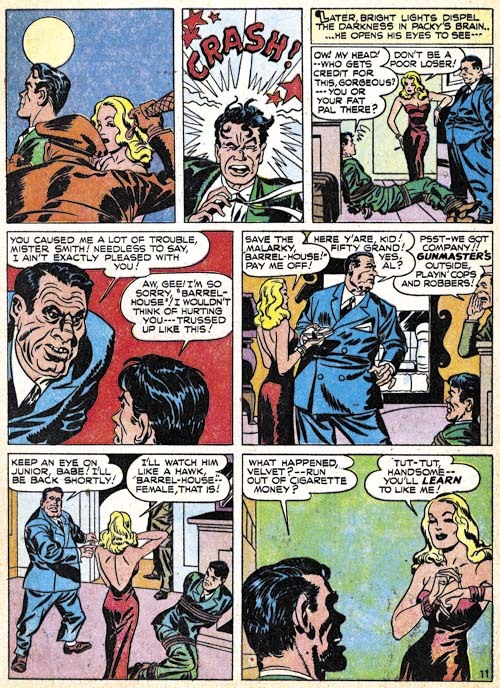 This device was common in Simon and Kirby romance publications but only seems to be used by Joe and Jack for the crime genre when the protagonist was a woman. Most likely this was because male criminals generally had a very bad ending while the woman repent and paid her debt to society. Apparently Simon and Kirby preferred not to kill or execute even villainous women but had no qualms about providing the male criminals with such fates. In all honesty this form of sexual discrimination is still very much prevalent today. The Simon and Kirby rule was all female villains where young and beautiful and would in the end repent their life in crime. But of course every rule has exceptions. I doubt many would call Ma Barker either young or beautiful. Not only does she come to a bad end, she does not sound very repentful either. It is a marvelous story that fortunately was included in “The Best of Simon and Kirby”. If you have not bought the book yet, what are you waiting for? All these manifestations of brutality, cruelty, and violence and the manner in which they are committed–that is the folklore of the comic books. “The Comics…Very Funny” certainly provide critics of comic books with useful ammunition. 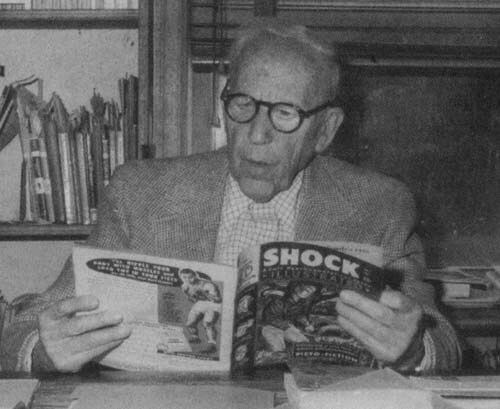 Frederic Wertham’s status as an authority and scientist carried much weight with the public. Wertham was effective in disarming his critics by pointing out that they were paid by comic book publishers. What was needed was someone independent from the comic book industry who could provide an articulate challenge to Wertham. Unexpectedly the most successful rebuttal was made by a 14 year old boy, David Wigransky. Wigransky’s defense of comic books was published in the July 24th issue of the Saturday Review of Literature, the same periodical that published Wertham’s article. Wigransky’s letter was published under the title “Cain Before Comics” but the biblical reference that seemed more appropriate was David and Goliath. On the face of it, it would seem unlikely that a boy could offer very much of an intellectual challenge to an authority figure like Wertham. However of the two, Wigransky’s is the much more thought out discussion. When I read Wertham’s “Seduction of the Innocent” I was greatly bothered why everyone from that time did not see through his badly argued and poorly supported attach on comic books. Well David Wigransky did see right through it. Wigransky pointed out that violence proceeded the creation of comic books. Further that good upbringing and reading good books were not proof against the adoption of murderous behavior in the young. While there were numerous readers of comic books, there were comparatively few delinquents. 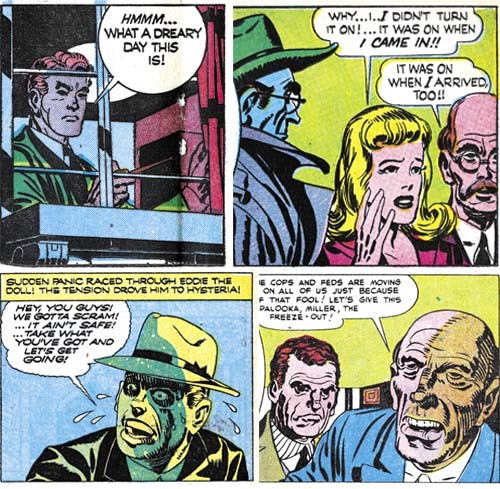 Wigransky noted that Wertham’s strong antipathy to comic books colored his investigations and reports. David suspected, correctly in my opinion, that Wertham manipulated his children patients to provide the evidence against comics that he, Wertham, expected. That the crusade against comic books was actually not really new; 1896 saw a crusade against the syndication comic strip “The Yellow Kid”. Crime and violence were looked at by comic book readers as adventure and excitement, not a something to experience. Wigransky predicted that generation of comic book readers would in the end turn out all right. My summation of Wigransky’s article hardly does it justice. The reader can find the entire letter reprinted in “Mr. Monster’s Comic Crypt” by Michael Gilbert (Alter Ego 90, December 2009). David Wigransky did a fabulous job of defending comic books against Frederic Wertham’s critical article. Wertham’s response was to totally ignore him. Wigransky is not once mentioned in “Seduction of the Innocent” nor were his arguments every addressed by Wertham. But not everyone ignored Wigransky’s defense. An editorial piece, probably written by Stan Lee, appeared in some Atlas Comics. The editorial not only mentions David Wigransky by name but includes quotes from his letter. Comic artists gratefully noted Wigransky as well. Alfred Andriola sent David the original art for a Kerry Drake strip titles “There’s your case against D.D.T., Mr. D.A.!”. The strip is dated December 26, 1947. It was signed “best wishes to David Wigransky from Kerry Drake and Alfred Andriola” (Cartoon Drawings: Swann Collection of Caricature and Cartoon). 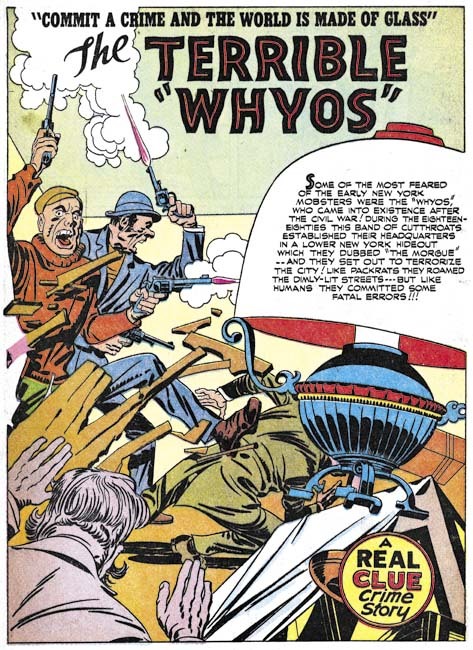 Headline #25 (July 1947), pencils by Jack Kirby, inks by Joe Simon, letters by Joe Simon? 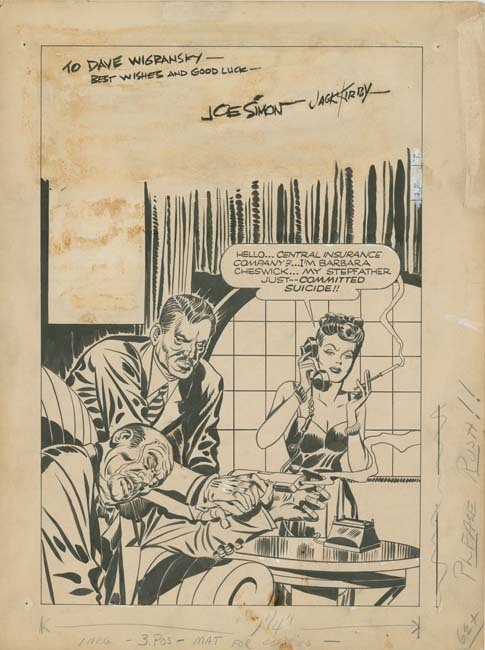 More pertinent to this blog is that Joe Simon and Jack Kirby also recognized Wigransky’s contribution by presenting his with original art, the cover for Headline #25 (July 1947). The inscription was by Joe but Jack signed it as well. The cover is an early one from the start of Simon and Kirby’s work for Prize Comics after the war. Simon and Kirby had only produced two previous issues of Headline while Justice Traps the Guilty and Young Romance had yet to be launched. This cover was an apt choice to give to Wigransky considering that at this time it was the crime comics that were receiving the most negative criticism. Headline #25 was certainly the most graphic crime cover that Simon and Kirby had done to date. While there were some later covers that depicted dead or dying figures, this was the only one that showed the victim’s wound. 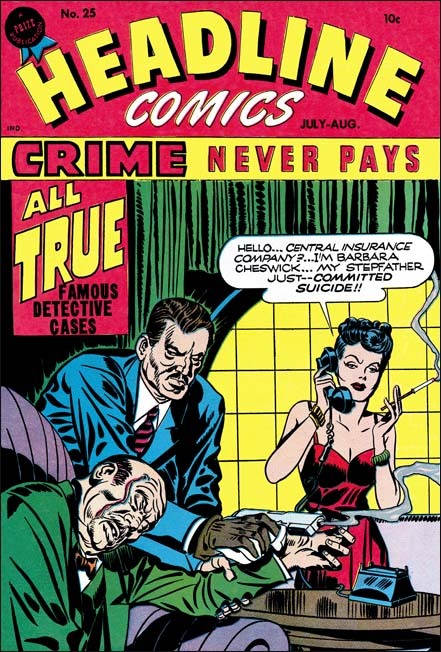 The cover featured the black humor that often accompanied Simon and Kirby’s crime covers. The female protagonist’s name was not random but was modeled on that of Barbara Stanwyck. 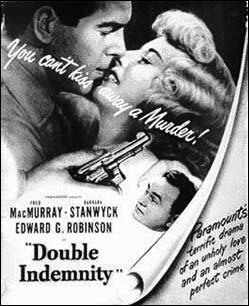 Not that long previously Stanwyck had starred in “Double Indemnity” (released April 24, 1944). However in the movie it is Stanwyck’s husband that was murdered for the insurance, while for the cover it was the step-father. Joe and Jack’s gift to David Wigransky was rather fortunate. Very little original art remains for Simon and Kirby’s early work on the crime genre. Today there is much more art for the earlier Stuntman and that only lasted two issues. 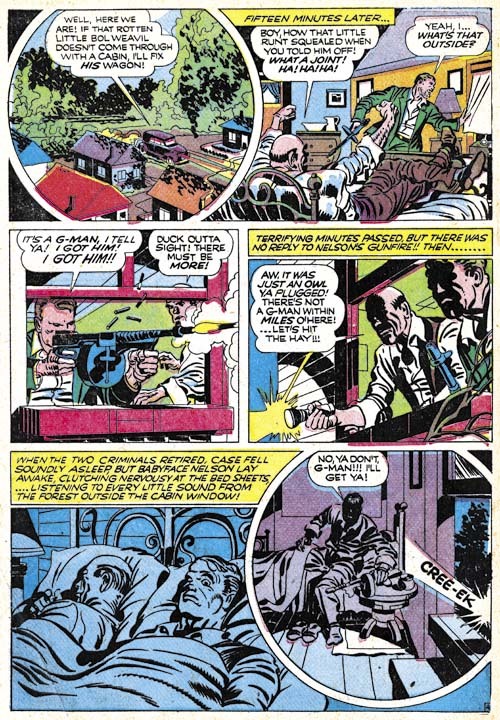 The only other original art from Simon and Kirby’s early crime comics that I am aware of is one splash panel (“The Case of the Floating Corpse”, Headline #24, May 1947 that originally came from Joe Simon’s collection) and one unfinished cover (intended for Headline #44, November 1950 that had been kept by Jack Kirby). The four corners of the original art for Headline #25 shows the imprint left by thumb tacks which can be seen even in the low resolution image I have provided. I like to think that they were used by Wigransky to fasten the art to his bedroom wall. 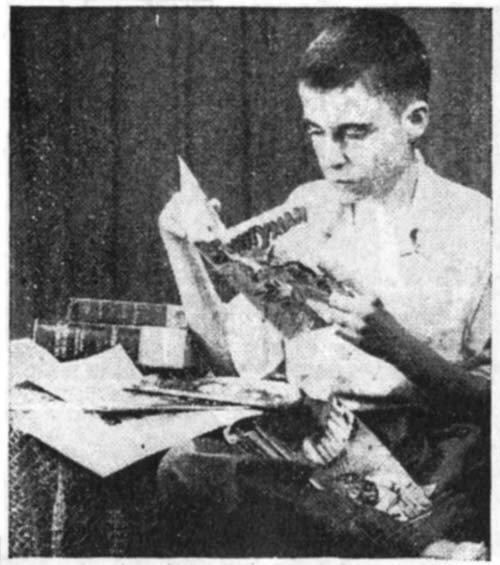 David Wigransky kept his interest in comic books at least for a couple of years. The December 1949 issue of Popular Mechanics includes an advertisement he ran looking for old comic books or original art. As an adult he wrote a book on the singer Al Jolson (“Jolsonography”, 1974). That rare work (a copy is being offered for $400) must have been published posthumously as David died in 1969 at what must have been about the age of 36.